Whether the vehicle is stationary or in motion, sports mode is selected by pushing the shift lever from the “D” position into the manual gate. To return to “D” range operation, push the shift lever back into the main gate. Upshifts do not take place automatically in sports mode. The driver must execute upshifts in accordance with road conditions, taking care to keep the engine speed below the red zone. 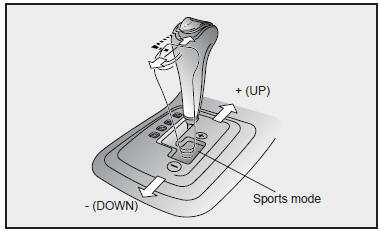 In sports mode, only the four forward gears can be selected. To reverse or park the vehicle, move the shift lever to the “R” or “P” position as required. In sports mode, when the engine rpm approaches the red zone shift points are varied to upshift automatically. When driving on a slippery road, push the shift lever forward into the +(up) position. This causes the transaxle to shift into the 2nd gear which is better for smooth driving on a slippery road. Push the shift lever to the -(down) side to shift back to the 1st gear.